This is a project that I designed based around my end teaching goals. I knew that I wanted to do a project with 3rd graders that covered value, tints, and shades, but also incorporated some math concepts. *The school I work at is always trying to get us to think about how to incorporate the common core into our lessons.. and this is something I am always actively trying to do. * So to begin the project I talk about value, tints, and shades with my kids. Next, each student is given a soufflé cup of tempera paint (with the same color as the color table they sit at; so blue table gets blue, purple table gets purple, etc.) and a popsicle stick. Each table is also given a cup of white paint and a cup of black paint. Using their popsicle sticks as a spoon, each student decides whether they want to make a tint of their color of a shade of it.. then they mix it up in their cup. Once they're happy with their color, they paint an entire 9"x12" piece of paper with it. -These go on the drying rack. 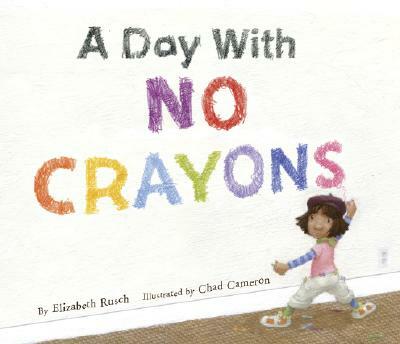 The next day they come in, the students and I start on the carpet and read the book "A Day With No Crayons" by Elizabeth Rusch. We talk about how colors often have creative and descriptive names (often using adjectives!). Like instead of just being "yellow"... something could be "laser lemon"! 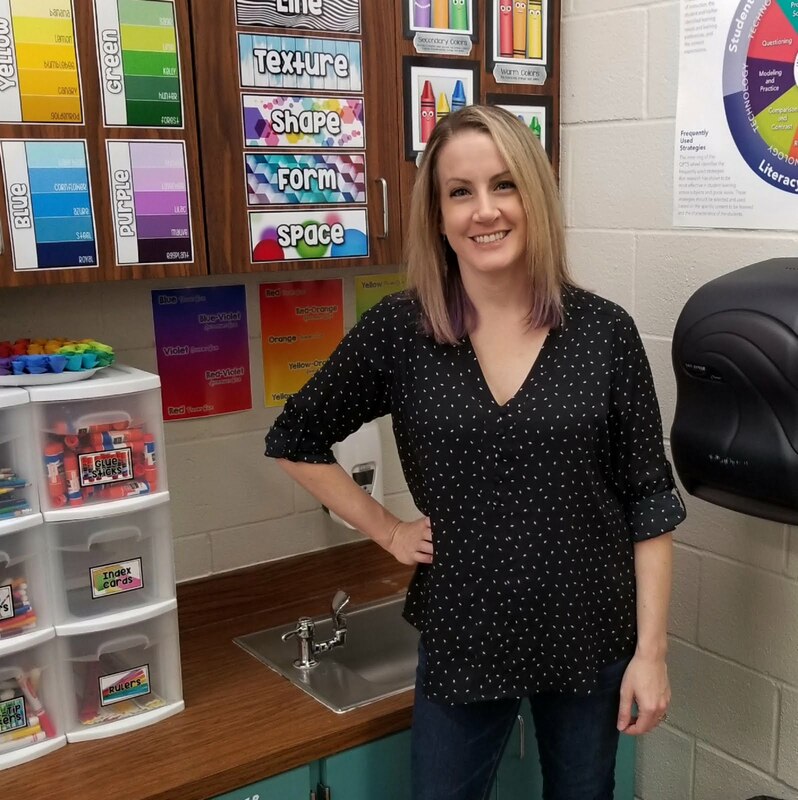 I also like pulling out a variety of paint chips and telling the students the cool names those have as well (time permitting - I'll read out a color name from a card and students guess which color it belongs to). Then I tell the students a bit more about what we'll be doing that week. Using a ice cream scoop stencil, students will trace and cut out as many scoops of ice cream as they can from their painted paper. 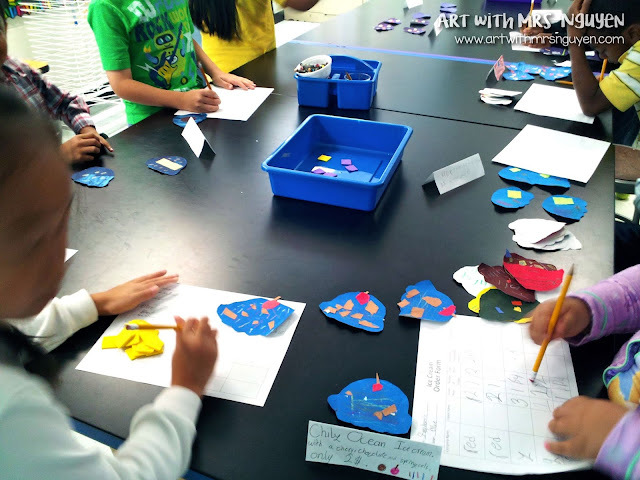 Then they will decorate their scoops using scrap paper and construction paper crayons. 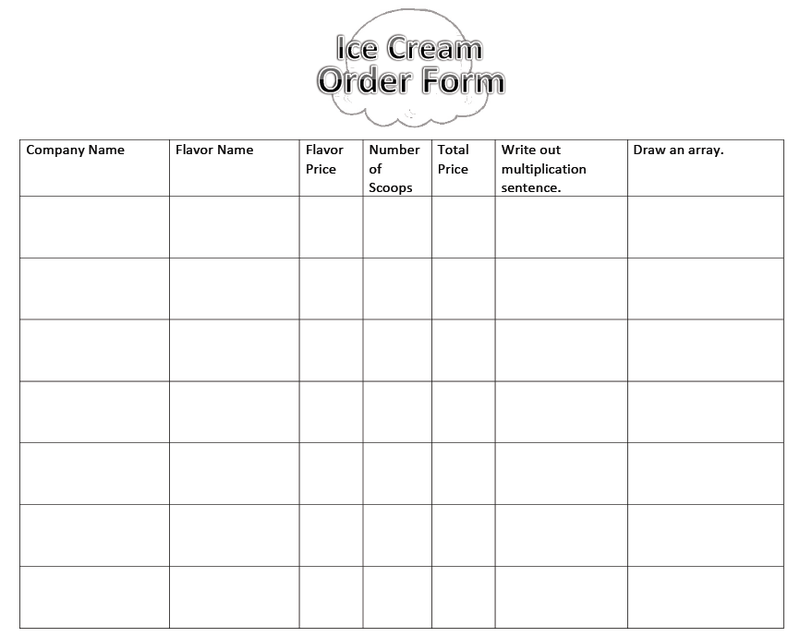 Each student will come up with ONE creative flavor name and will decorate all their own scoops accordingly - so each student ends up with 5 or 6 scoops which look close to the same. Then I tell them that they will be working with their table group to create their very own ice cream shop! I have about 4-5 kids per table in 3rd grade.. so each ice cream company then has 4-5 flavors. The kids must come up with a shop name, and create a poster advertising their shop and it's flavors. 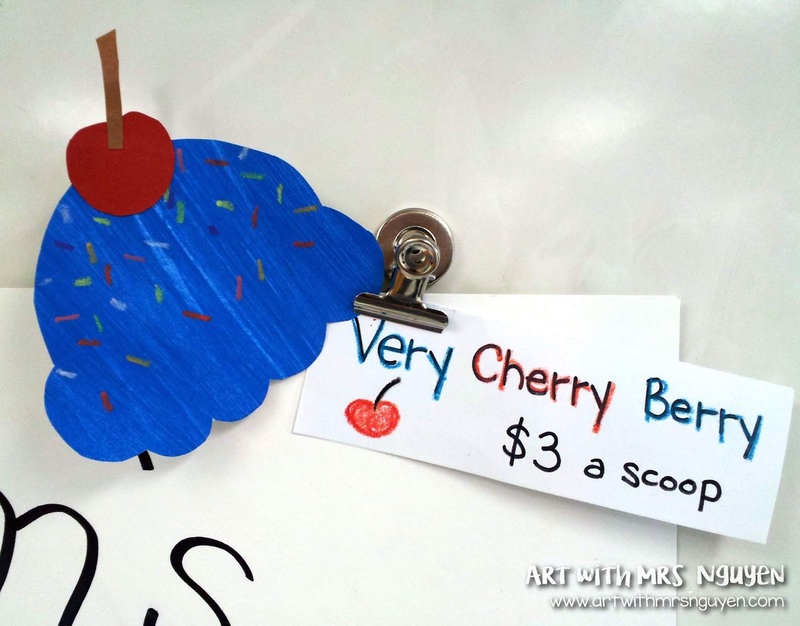 Students also must come up with a price for their ice cream (per scoop) between $1 - $5. *The price must be whole dollars - no tax (yes the kids ask me this every time I teach this lesson)! ;) They'll create a flavor tag using a folded piece of 6" x 4" paper that lists their flavor name and price. The kids spend a couple days getting all of this together.. then when they come into class on Friday, it's game time! 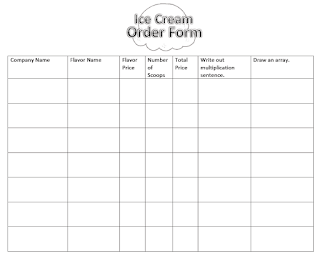 Students will "buy" and "sell" their own ice cream scoops to other tables to try to be the most successful ice cream company in the class. So on Friday I have the kids set up their tables by laying out their ice cream scoops and setting up their flavor tags and posters. Then I give each table a bag of foam squares and have each student count out 20. Each foam square will represent $1 in our game. Then I distribute an "ice cream order form" and explain it to the kids. I will select 2 tables at a time to be "buyers" while the other 4 tables are "sellers". Buyers will walk around to the other tables with their order form, foam squares (or "money"), and a pencil and select what ice cream they'd like to buy. When they fill out the form they must fill out the company name (of the table they are buying from), flavor name, and the price of each scoop. Then they must decide how many scoops they want to buy. For example, my "Very Cherry Berry" is priced at $3 a scoop.. so if I wanted to buy 2 scoops, I would write that down, then in the column that says "multiplication sentence" I would write ($)3x2=($)6. Then I would draw an array representing that. **Multiplication and arrays were what my 3rd graders were learning in math at that time! They would then give the student who they were buying from their foam squares as money, and the seller would give the student their ice cream scoop. The money was then put into the tables "cash register" (a bucket in the middle of the table that would later be counted). Any money that wasn't spent by buyers at the end of their round would be forfeited to "Ms. Gram's Charity Cup". To ensure no table was cheating by putting their extra money into their own registers - I color-coded it so each color table had foam squares of the same color (so yellow table had yellow money, green table had green money, etc.). After every group had the opportunity to be a buyer, I counted up all the cash registers and announced a winning table (who got to visit my classroom treasure chest). They kids LOVED this game! Plus they got to keep whatever ice cream scoops they bought from their classmates, and whatever ice cream scoops of their own that did not sell.. so everyone walked out with a bunch of different artwork! 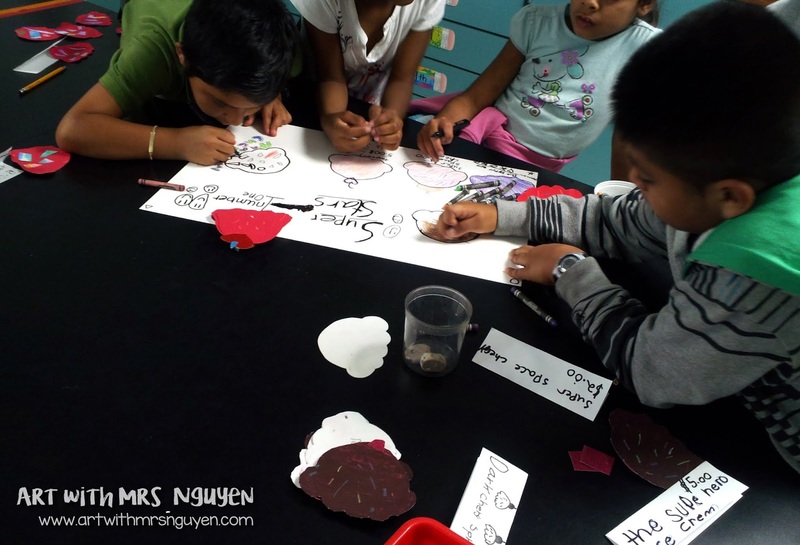 :) I think my favorite part of this project was when I'd have a student realize and tell me they were doing math.. but it was FUN! !